ART HOLIDAY on the AMALFI COAST. 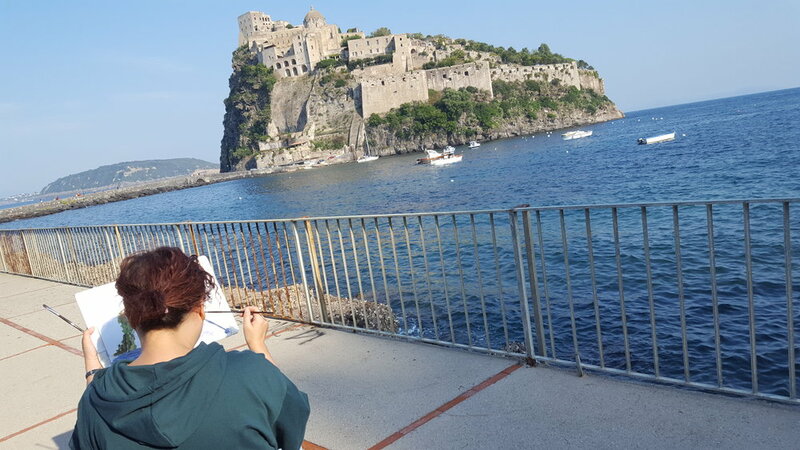 Painting/drawing art class holiday Italy on the Amalfi Coast. Fabulous excursions in Sorrento, Amalfi, Pompeii, and the island of Procida/Ischia and Capri. Single accommodation in a villa on the Amalfi Coast. Sun April 21 - Sun April 28 2019 SOLD OUT - Tutor Alan B. Below, a feel-good video of our last painting trip on the AMALFI COAST & CAPRI, Pompeii, Positano, Ischia. Enjoy!!! PAINTING HOLIDAYS in Italy | CAPRI & The AMALFI COAST: Pompeii, Positano, Ischia, Sorrento. Finally, a painting holiday in Europe where you can do art in fabulous Amalfi, Pompeii and on the island of Capri on the same trip. Join us! Sunday to Sunday on the Amalfi Coast. 6 days of tutoring with a qualified tutor who knows the area of this painting trip and who will guide you throughout the week. Equipment is provided on this Amalfi art vacation. Guiding on breathtaking painting spots/excursions throughout the week: Capri island, Amalfi, Pompeii. Local transportation: Shared rental car. About the accommodation. The villa is in the hills on the coast, partly overlooking the Mediterranean. There is a grocery shop, restaurant and pizzeria within walking distance. You’ll enjoy the terrace and the above-ground swimming pool which the early October group will still be able to enjoy! This villa has a fully equipped kitchen. Guests and tutor will have breakfast in a relaxed environment. Meals are extremely flexible and also economical. When at the villa, painters will have a choice of joining group outings at restaurants or to make their own meals at the villa. Some bedrooms are ensuite, w/ a private bathroom. (You will be given room preference options when booking.) Below are photos of this year’s villa for our 2019 Amalfi Coast art holidays in Italy. DAY 1 (Arrival): Welcome, then group dinner with an introduction to the painting holiday. DAY 2: Morning breakfast at the villa. On this first full day as a small group, each guest will have individual one-to-one time with the tutor to discuss expectations. Morning and afternoon painting sessions will be spent at the villa by the pool, punctuated by lunch. Free time around 4.30 pm. Those wishing to continue to paint will be welcomed to do so. Dinner. DAY 3: Breakfast. Then group and tutor will head for gorgeous AMALFI, a jewel of the coast. What stunning views! (The photo below is a view of POSITANO in one of our 2018’s trips.) The day will be spent painting in Amalfi, with a lovely lunch on the water. After the afternoon session, it is back to the villa by the end of the afternoon. Dinner. Wendy from one of our 2018 Amalfi coast group in Positano. DAY 4: Breakfast. A relaxed day at the villa is planned, painting by the pool. Painters will have a choice of doing a still-life (botanical or other), or to work on any unfinished Amalfi painting(s). DAY 5: Breakfast. A day’s extraordinary excursion which starts with an enjoyable morning ferry from Sorrento to the famous and beautiful island of CAPRI where tutor and group spend the day at Anacapri painting at Monte Solaro. Lovely lunch on the island. Back to Sorrento by ferry in the evening, then to the villa. Dinner. DAY 6: Breakfast. Morning painting at the villa. Lunch. In the afternoon, group and tutor will go by the beach near the cliffs of Vico Equense, less than 30 mn from the villa. Gorgeous painting of boats, rocks etc. DAY 7: Breakfast. Day’s excursion to POMPEII, which group and tutor will reach by train. Lunch and afternoon in the mysterious ancient city. We will not be doing full-fledged painting inside, but rather sketching and sightseeing inside the ruins. Back to the villa in the evening. Dinner. Day 8: Last breakfast as a group. Tutor and group then travel to Naples airport by train. Goodbyes. Phone number (optional) + country code. PLANNING MY POMPEII - AMALFI COAST PAINTING / DRAWING TRIP. WHAT’S NOT INCLUDED? Getting to Sorrento. Meals (Cost of meals depends on each person, what you order etc. You can also make economical ‘at home’ meal.) A few bus tickets to get around (£1 or so each). Pompeii train (£5 round trip). Pompeii entry (£15). Ferries (about £60 total). This painting holiday on the AMALFI COAST is a watercolor holiday, but also an acrylics and oil painting holiday, and is generally called a multi-media art holiday. Fabulous art holiday in Italy! A spectacular artistic adventure you'll never forget on the remarkable Amalfi coast in the heart of the Mediterranean. Painting / drawing on extraordinary excursions to AMALFI, intriguing POMPEII and majestic CAPRI. Paint (or draw, whatever you prefer) in a small group with a talented tutor in one of the most breathtaking places on the Mediterranean! The Amalfi Coast art holiday group will stay in Sorrento in a group rental (house or condo/flat). From there, the group and tutor will head every morning for painting outings, extraordinary excursions, and group meals. The tutor will teach and also guide the group throughout the week to some astonishing two-in-one sightseeing/painting sites. We take you within the depths of the incredible unearthed ancient city that is Pompeii, where you’ll discover its secrets, admire the bejeweled remnants of a surprising lifestyle, and be forever moved by the eternal silence of its inhabitants. On this one of a kind painting trip, you also discover AMALFI, a jewel nested on the Amalfi Coast, where blue is bluer than blue. Your palette will overflow with colors, and painting/drawing takes a whole new dimension. On this art trip you also get to capture in color, the marvelous island of Capri.